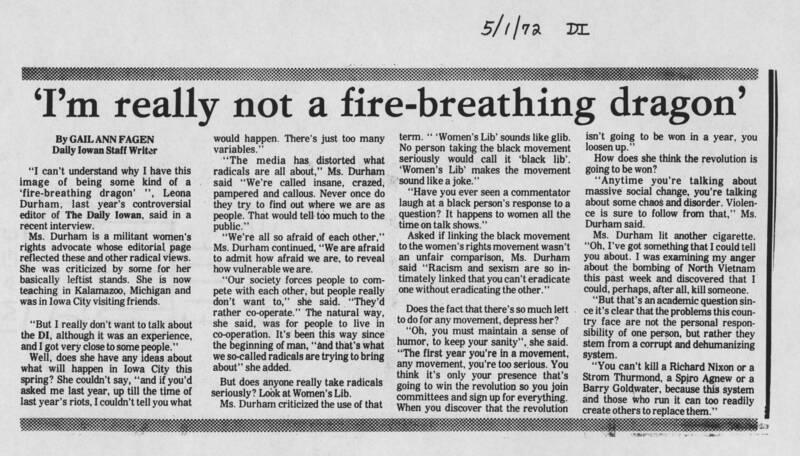 DIY History | Transcribe | Social Justice | Daily Iowan and Leona Durham controversy, 1970-1972 | 1972-05-01 Daily Iowan Article: "I'm really not a fire-breathing dragon"
1972-05-01 Daily Iowan Article: "I'm really not a fire-breathing dragon"
5/1/72 DI 'I'm really not a fire-breathing dragon' By GAIL ANN FAGEN Daily Iowan Staff Writer "I can't understand why I have this image of being some kind of a 'fire-breathing dragon' ", Leona Durham, last year's controversial editor of The Daily Iowan, said in a recent interview. Ms. Durham is a militant women's rights advocate whose editorial page reflected these and other radical views. She was criticized by some for her basically leftist stands. She is now teaching in Kalamazoo, Michigan and was in Iowa City visiting friends. "But I really don't want to talk about the DI, although it was an experience, and I got very close to some people." Well, does she have any ideas about what will happen in Iowa City this spring? She couldn't say, "and if you'd asked me last year, up till the time of last year's riots, I couldn't tell you what would happen. There's just too many variables." "The media has distorted what radicals are all about," Ms. Durham said "We're called insane, crazed, pampered and callous. Never once do they try to find out where we are as people. That would tell too much to the public." "We're all so afraid of each other," Ms. Durham continued, "We are afraid to admit how afraid we are, to reveal how vulnerable we are. "Our society forces people to compete with each other, but people really don't want to," she said. "They'd rather co-operate." The natural way, she said, was for people to live in co-operation. It's been this way since the beginning of man, "and that's what we so-called radicals are trying to bring about" she added. But does anyone really take radicals seriously? Look at Women's Lib. Ms. Durham criticized the use of that term. " 'Women's Lib' sounds like glib. No person taking the black movement seriously would call it 'black lib'. 'Women's Lib' makes the movement sound like a joke." "Have you ever seen a commentator laugh at a black person's response to a question? It happens to women all the time on talk shows." Asked if linking the black movement to the women's rights movement wasn't an unfair comparison, Ms. Durham said, "Racism and sexism are so intimately linked that you can't eradicate one without eradicating the other." Does the fact that there's so much left to do for any movement, depress her? "Oh, you must maintain a sense of humor, to keep your sanity", she said. "The first year you're in a movement, any movement, you're too serious. You think it's only your presence that's going to win the revolution so you join committees and sign up for everything. When you discover that the revolution isn't going to be won in a year, you loosen up." How does she think the revolution is going to be won? "Anytime you're talking about massive social change, you're talking about some chaos and disorder. Violence is sure to follow from that," Ms. Durham said. Ms. Durham lit another cigarette. "Oh, I've got something that I could tell you about. I was examining my anger about the bombing of North Vietnam this past week and discovered that I could, perhaps, after all, kill someone. "But that's an academic question since it's clear that the problems this country face are not the personal responsibility of one person, but rather they stem from a corrupt and dehumanizing system. "You can't kill a Richard Nixon or a Strom Thurmond, a Spiro Agnew or a Barry Goldwater, because this system and those who run it can too readily create others to replace them."